It is an early 20th. century large Pearline Lustrine Vase on a highly iridescent Blue ground. Enamelled scenes are outlined in gold, depicting two ducks in the foreground on a pond with rush leaves in the background and a water lilly in the immediate foreground. 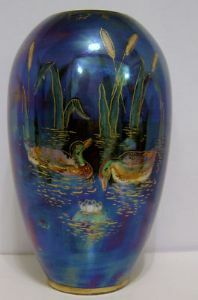 To the rear is a scene depicting the duckling on the pond with rushes again in the background. There is an impressed mak showing 80. It stands approx 9 inches (23 cms) tall. It is backstamped and shows Aquatic Lustrine - Fieldings - Stoke-on-Trent - England.